In The Consolations of Philosophy, published in 2000, Swiss-British thinker Alain de Botton examines the ways in which teachings from the canon of Western philosophy can be used to combat, or at least alleviate, the problems and worries of 21st-century life. The book is broken down into six chapters, each devoted to a specific worry—unpopularity, financial distress, frustration, inadequacy, romantic woes, and a catch-all chapter on life’s difficulties in general. As consolation for these ills, de Botton prescribes the teachings of Socrates, Epicurus, Seneca, Montaigne, Schopenhauer, and Nietzsche, respectively. De Botton provides a brief biography of each philosopher, describing the hardships faced by each in his own life, how these personal difficulties influenced the development of their individual philosophies, and how the reader of today can benefit from those same philosophical ideas by applying them to their own problems. Along the way, de Botton gives pithy encapsulations of the thought of these six illustrious thinkers, liberally sprinkled with quotes from their work. He does a very admirable job of summarizing these big ideas in clear and simple language, devoid of philosophical jargon, that is not only accessible but also entertaining to the general reader. For those uninitiated into the reading of philosophy and perhaps even intimidated by it, this book would make a great introduction to the subject and a persuasive argument for the relevance of philosophy to daily life. The problem, of course, is how do you get those unfamiliar with philosophy to read this book in the first place. If you’re the type of reader who’s willing to tackle a book with the word Philosophy in the title, and you’ve even heard of Alain de Botton, then you probably already have an interest in the field, in which case you will most likely find that this book inspires a profound “Duh.” Those who already appreciate the teachings of the worthy philosophers chosen for inclusion will make few new discoveries here. De Botton’s lively and engaging prose and knack for selecting interesting biographical anecdotes rescues this book from becoming another Philosophy for Dummies, yet it still amounts to little more than a secular Chicken Soup for the Soul. For those who are already well aware of the consolations of philosophy, it serves much the same function as a book of well-chosen quotations or aphorisms, in that some pleasant comfort is derived from reviewing the main thrust of these philosophers’ teachings as de Botton has rendered them in a nutshell. De Botton is to be commended for attempting to popularize philosophy and remind us all of the relevance of philosophical inquiry to our daily lives. This book reads like a preface to a larger body of work devoted to this mission, hopefully to be followed up by more penetrating works on specific issues. His 2012 book Religion for Atheists, for example, is a more intellectually challenging and originally argued book that presents a more focused argument for the relevance of philosophy. The Consolations of Philosophy is far more simplistic, but if it finds its proper audience it will prove a rewarding and enlightening read. Darrell Standing is an inmate in San Quentin Prison. A former professor of agronomics at the University of California, he was convicted of a murder he admittedly did commit. Once incarcerated, he is wrongly accused of a conspiracy to escape, and unjustly sentenced to solitary confinement. He spends five long years in solitary, during which he endures frequent beatings and long periods bound in a straitjacket. The near suffocating constriction of the jacket has an unexpected side effect. Over time, Standing develops the ability to separate his consciousness from his imprisoned body, enabling him to travel through time and space to experience past lives. Among the many personalities he inhabits while in the jacket are Count Guillaume de Saint-Maure, a swordsman of medieval France; Jesse Fancher, a nine-year-old member of a wagon train crossing Utah in 1857; a nameless 4th-century hermit in Egypt; Adam Strang, a 16th century Englishman, supposedly the first white man to set foot in Korea; Ragnar Lodbrog, a Norse-born Roman centurion in the service of Pontius Pilate; Daniel Foss, a seal hunter shipwrecked on an Antarctic isle in the early 19th century; and a series of prehistoric tribesmen representative of various ages of mankind’s distant past. In his death row cell, Standing compiles a manuscript detailing the biographies of these past lives, as well as the harsh conditions he endures at San Quentin. The Star Rover, also known as The Jacket, was published in 1915. Though considered a novel, the book really reads more like a collection of short stories loosely tied together by the prison narrative. Like most of Jack London’s work in the genre of science fiction, it is audaciously imaginative and years ahead of its time, yet it may have been conceived simply as an opportunity for London to try his hand at historical fiction. While the Kiplingesque tale in Korea and the wilderness survival tale of the shipwrecked sailor seem right at home within his body of work, the swashbuckling French story seems more fitting to Alexandre Dumas, while the tale of the Roman soldier is reminiscent of Lew Wallace’s Ben-Hur. London seems to relish the opportunity to cast his net so far afield, but he achieves mixed results. There is little cohesion between the various lives or with the prison story that frames them. In the penultimate chapter, London tries to tie everything together with a sweeping panorama of the history of mankind, interwoven with his philosophy of the meaning of life. While the conclusions he reaches in this chapter are arguable, the power and mastery of his writing is undeniable. It’s as grandiose and hyperbolic as anything he’s ever written, straddling the line between genius and mania. Fans of London will enjoy this book because it’s like a Frankenstein’s monster of all of his pet interests: agricultural science, prison reform, evolution, seal hunting, prehistoric man, the supernatural, sailing, Korea, manifest destiny, and so on. It’s like a patchwork quilt of clippings from his entire career. I wouldn’t recommend this book to someone who’s new to London, because to the uninitiated reader it might all just seem like a big incoherent mess. Like many of London’s works, there’s also an unfortunate undercurrent of racism. Standing only seems to be able to channel Aryan males, and many of the stories share the theme of the blonde-haired, blue-eyed race conquering the globe. Thankfully it’s more subtle and less offensive than some of London’s more overt statements on race. For most of the book, London speaks of humanity in universal terms, and The Star Rover reads like a celebration of the resilience of the human spirit. At times it can be quite inspirational, at times depressingly brutal, and at other times just plain bizarre. Outside of the Sherlock Holmes stories, Sir Arthur Conan Doyle’s most famous creation is the scientist and adventurer George Edward Challenger. Professor Challenger starred in three novels and two short stories, beginning with The Lost World, first published in 1912. Edward Malone, a journalist of athletic build but timid demeanor, seeks an interview with Challenger, hoping the eccentric misanthrope might provide some good copy for his paper. Though at first Challenger is hostile to the reporter out of a general hatred for those of his profession, he soon takes a liking to the young man. The relationship between the two characters is very similar to that between Holmes and Watson, except that Challenger is a bigger jerk than Holmes and a far less intriguing character. Challenger reveals to his newfound confidant that in the Amazon rain forest he has discovered a remote plateau where prehistoric creatures that have long been thought extinct still thrive. When Challenger makes his findings public before a meeting of the Zoological Institute, he is confronted by doubters. To test the veracity of his claims, an expedition is hastily organized, consisting of Dr. Summerlee, a rival scientist; Lord John Roxton, an aristocratic sportsman, and Malone, who volunteers for the journey in hopes not only of finding a good story but also of adding some much-needed adventure to his life. Malone is the narrator of the tale, and most of the book is written in the form of letters sent back to his newspaper. This makes for an awkward construction, as it becomes clear that at the end of every chapter Malone is going to be safe in camp scribbling his account, while some overly convenient method will be contrived for an Indian to carry off his letter to the civilized world. The Lost World is the prototypical tale of a team of scientists venturing into unknown lands, upon which Jurassic Park is just one of hundreds of descendants. In typical Conan Doyle fashion, the story starts out at a rather slow pace, with secrets being revealed gradually over time. Though this challenges the attention span of the 21st-century reader, there is a charming freshness to the sense of wonder expressed when remarkable discoveries are finally made. Dinosaurs live! It should come as no surprise that the expedition eventually reaches the plateau and finds the prehistoric creatures in question. The fact that the adventurers are not travelling back in time, but rather visiting an area of evolutionary stagnation, allows Conan Doyle to indulge in some evolutionary anachronisms. In this world, unlike in prehistoric reality, dinosaurs coexist alongside prehistoric mammals, ape-like humanoids, and modern Native Americans. One of the book’s disappointments is that it does not spend enough time on the dinosaurs, but brushes by them rather quickly in order to focus on the apemen, at which point it becomes just another white-man-conquering-the-savages story. Throughout the book, the expedition members seem less concerned with practicing science than they are with invading a new territory. Towards the end of the book, the expedition team makes a choice that no scientist would ever make, a choice to destroy rather than to preserve. The overall message of the book, rather blatantly stated, is one of the superiority of man over nature, and, less obviously, of white European men in particular. Though it was perhaps ground breaking for its time, and it’s certainly a step above run-of-the-mill pulp fiction, The Lost World has since been surpassed by many of the imitators it inspired. Those who appreciate classic adventure fiction will find much to appreciate, but it should not be considered a must-read by any means. 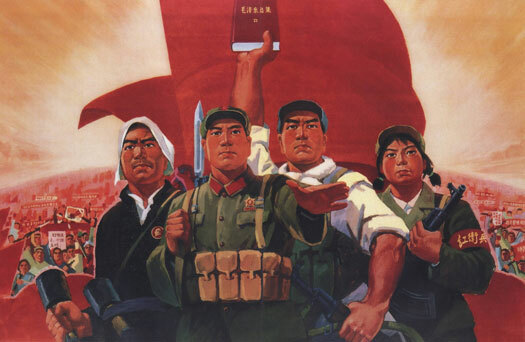 There is more than one book with the title Chinese Propaganda Posters, so let me start by clarifying that I am reviewing the 2011 edition of the volume published by Taschen with the subtitle “From the Collection of Michael Wolf.” The original edition was published in Germany in 2003. This 2011 edition features side-by-side text in three languages: English, German, and French. Even if you don’t agree with the ideology of a particular regime, looking at its propaganda art can be a moving experience. That is made abundantly clear in this gorgeous book that reproduces over 300 propaganda posters from Communist China, ranging roughly from the 1950s through the 1980s. These powerful and attractive works of popular art deliver imagery that is rarely seen in the art galleries of capitalist countries. Only in the occasional work of public art or community murals might we see portrayed such uncynically positive imagery—paeans to agriculture, industry, labor, and technology; celebrations of natural beauty and the human spirit; and illustrations of the benefits of hard work and diligent study. 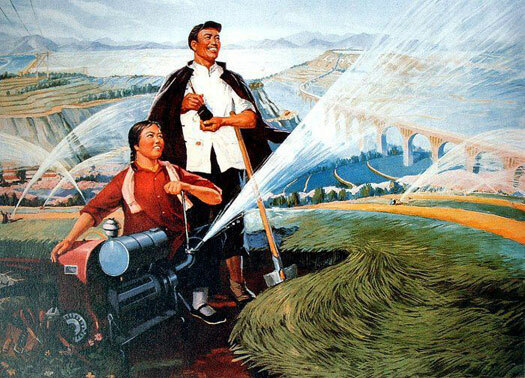 Of course, in the case of China under Mao Zedong, most of the utopia that’s depicted is a lie. Yet, the artists of America and Europe—where it seems art must always be reacting against something—could learn a lot from the art of socialist and communist societies—where the purpose of art is to promote a better world, even if the reality falls far short of the ideal. Those who enjoy representational painting will appreciate the style of socialist realism in which these posters are painted. For the most part they are quite skillfully executed, even when the “realism” doesn’t necessarily reflect reality. The dual feeling of admiration and disgust inspired by these images is aptly expressed in two brief essays by Chinese writers Anchee Min and Duo Duo. A third essay by Stefan Landsberger, a collector and scholar on the subject, gives an overview of the history of the propaganda poster in China. Beyond that, the text of the book consists entirely of captions and brief quotes from Mao. The captions, for the most part, are strictly translations of the Chinese text in each image, along with the name of the artist, date, and print run of the poster. In rare cases there may be a footnote identifying a person, place, or concept depicted in the poster. The book would have benefited greatly from more of such supplementary historical context. Despite providing a brief historical chronology, the editor assumes a level of knowledge in Chinese history and culture that the typical American or European art lover is unlikely to possess. Taschen, the publisher, is known for producing sumptuous art books, and this one is no exception. Each and every image is beautifully reproduced, though they are frequently cropped to fit the page. Any deficiencies of the book are simply the low points of Wolf’s collection. The posters depicted in the book are almost all four-color reproductions of color paintings. With the exception of one image on page 9, no coverage is given to the Chinese tradition of block printed posters in black and red. Wolf has an evident fondness for depictions of cherubic children, a subject matter which unfortunately does not evince the most aesthetically pleasing results. The lovable little imps are often endowed with clumsily rendered, almost adult faces, the repetition of which produces an effect similar to a creepy doll collection. Overall, however, this book is a welcome feast for the eyes to those who enjoy this brand of imagery. Though some additional interpretive text would have been welcome, it is an excellent collection of images. The first two chapters of A Man’s Woman are absolutely riveting. An arctic expedition team, after failing to reach the North Pole, marches across the jagged and shifting ice, struggling southward in hopes of meeting with a rescue ship. Their own ship having been crushed by the encroaching ice, they trudge through the wind-scoured wasteland, as sled dogs drag their lifeboats toward some elusive stretch of open water. Over the course of months of endless toil and incredible suffering, members of the party fall prey to frostbite, starvation, and disease. Author Frank Norris captures this experience in vivid naturalistic detail. This is not Jack London’s frozen North, idealized in its beauty, power, and glory. This is a gritty and gruesome reality, where brave and hardy men are reduced to less than animals. In his depiction of the tragic ordeal, Norris provides a gripping drama that keeps his audience firmly rooted to the edge of their seats. A Man’s Woman, first published in 1900, is not a novel of arctic adventure, however. It is a story of what happens to the survivors after they return to civilization. The book’s primary focus is a love story between two strong-willed and career-driven characters. It examines the question of how much two individuals can compromise their lifestyles and personalities for the sake of their relationship, without totally losing themselves in the process. As is characteristic of Norris—the chief American practitioner of literary Naturalism—the many sights, sounds, and smells of the story are catalogued with a detail and authenticity that rivals reality itself. The thought processes of the characters are transcribed with equal thoroughness and with great psychological insight. The story, however, is far more melodramatic than one expects from Norris. Each scene seems so calculated to be emotionally manipulative that the overall effect is off-putting. The whole book revolves around one extremely overwrought central scene in which the male and female leads exhibit behavior that is both irrational and unrealistic. Throughout the novel, the plot elements are quite predictable. At the start of each chapter the reader can easily see where he’s being led, which inspires a feeling of impatience at being forced to sit through pages of interior monologue, the end result of which is a foregone conclusion. As usual, Norris’s mastery at establishing setting and mood is evident in this novel, but the story he tells does not do justice to the world he has created. Frank Norris never wrote a bad novel in his life (though he did write some bad short stories). Of the seven novels he completed during his all-too-brief career, however, one of them has to be his worst, and this is it. Diehard fans of Norris will nonetheless recognize moments of characteristic genius here. Casual readers investigating this great American novelist would be better served by reading his masterpieces The Octopus and McTeague. Though not a terrible novel by any means, A Man’s Woman is the Norris novel least worthy of reading. At the end of the 19th century, Nobel Prize-winning author Henryk Sienkiewicz produced a monumental trio of epic historical novels, known simply as The Trilogy, in which he detailed the military triumphs and tragedies of the Polish-Lithuanian Commonwealth during the 17th century. On the Field of Glory, published in 1906, is an odd sequel of sorts to these excellent novels. Although none of the fictional characters of The Trilogy appear in this later novel, some are mentioned in passing conversation alongside real historical figures, indicating that Sienkiewicz intended this book to exist in the same fictional/historical universe as those earlier works. The book’s title and subtitle, “An Historical Novel of the Time of King John Sobieski,” lead the reader to believe that he is in for the same brand of sword-clashing action delivered by With Fire and Sword, The Deluge, and Pan Wolodyjowski, yet On the Field of Glory is a book of a different breed. Like the novels in The Trilogy, this book begins with personal matters on the home front. The hero faces a disgrace from which he must redeem himself, and the best way to do so is through brave service to his country. In this case the protagonist is the young knight Yatsek Tachevski. (This review is based on the English translation by Jeremiah Curtin, so I am using his spelling of proper names.) Although descended from an old, respected noble family, Yatsek nonetheless has fallen into poverty and has little to show for his distinguished pedigree but a small rural estate. The book begins with Yatsek fighting a series of duels. Rather than inspiring swashbuckling romance, however, these duels only serve to remind one of the stupidity inherent in a chivalric code that forced reasonable men who respect one another to maim each other over the slightest of insults. News soon arrives that war with the Turks is imminent, and all the male characters prepare to depart for battle, including Yatsek, who is absent for most of the book. The novel then focuses on his love interest, Panna Anulka Sieninski, a beautiful, orphaned young noblewoman who lives on a neighboring estate with her guardian, Pan Gideon. Her beauty and her orphanhood make her a target for some unsavory individuals who seek to prey upon her honor and her estate. In Yatsek’s absence, it is up to his friends to protect her. As the book goes on, it eventually becomes clear that the story will never reach the battle promised by the title, and that the entire book will consist of Anulka’s plight. Halfway through, Sienkiewicz seems to realize that his initial villain is not dastardly enough, so he changes horses mid-stream by offering a new one. The book does succeed in capturing some of the atmosphere of The Trilogy books, like the camaraderie among soldiers swapping old war stories, and the honor of gentlemen toward their ladies. There’s quite a bit of comic relief worked into the conversation, though I suspect half of it is lost in translation. Sienkiewicz, through his characteristic Catholic perspective, tries to encapsulate the Polish spirit during this bygone era. At this time the Commonwealth possessed the most formidable military in Europe, and the Poles depicted here see themselves as chosen by God to defend Christian Europe from the pagans. The male characters all have a die-with-your-boots-on mentality, confident that they will be rewarded in Heaven for their selfless sacrifice. While this is par for the course in adventure novels, Sienkiewicz takes it so far that the writing often reads like a propaganda pamphlet for Polish pride. On the Field of Glory is not a bad novel, but it doesn’t compare to Sienkiewicz’s masterpieces. Ultimately it feels like scenes lifted from The Trilogy and cobbled together in an attempt to recapture some of his former glory. If you are a real Sienkiewicz fan and an enthusiast of Polish history it’s worth a read, but don’t expect to be awestruck. The biggest problem with this novel is its unnecessary length. It’s as if London set out with the intention of writing a fifty-chapter novel, without a sufficient story to merit such an extensive treatment. There are forty-five men on the Elsinore, and London dutifully provides each with a name, racial pedigree, physical deformity, and psychological abnormality. These characteristics are examined and reexamined ad nauseam, yet the only character who really stands out as memorable is the brutal old first mate Mr. Pike. London does an admirable job providing a vivid description of what it’s really like to sail around the Horn, but regrettably it’s a voyage of tedium and misery. Twenty-five, thirty, thirty-five chapters go by and the reader wonders if he’ll ever come to the conflict promised by the book’s title. In the meantime here’s yet another chapter about a storm or a sunset. When adventure does arrive it’s too brief to justify the painfully slow buildup. Throw in a gratuitous romance with the captain’s daughter and cap it all off with an unsatisfying ending that leaves important questions unanswered, and what you’ve got is a novel best avoided. London’s fascination with issues of race and class is quite evident in this book. The ship serves as a microcosm for the class structure of society; the officers and passengers represent the aristocracy while the crew represent the unwashed masses. Pathurst makes the observation that all those in command are fair-skinned, blonde-headed, and blue-eyed, while those who toil beneath them are all brunettes of the “swarthy races”. This observation in and of itself is not offensive, but when the assertion is continually made that those of Aryan descent are destined to rule and to govern, the book steps over the line and out of my comfort zone. Far from just a passing mention, this concept of white supremacy becomes one of the central themes of the book. Though having read much of London’s work and being familiar with his attitudes on race, this book may be the most overtly racist work of his that I’ve ever read, and I was surprised to find him clinging to such ideas so late in his career. Due to London’s prodigious skills as an adventure writer, this is not a horrible book. It’s certainly not, however, a good book, and should be spared the time and effort of anyone but the most curious and enthusiastic of London aficionados. Edgar Rice Burroughs deserves a healthy dose of applause for creating the timeless character of Tarzan. The jungle hero has had an indelible impact on popular culture, becoming a household name through his many incarnations in novels, film, and comics. With such classic literary icons, it’s often interesting and fun to go back and read the original source material from which they sprang. That’s not true in this case, however, as Tarzan of the Apes, originally published in 1912, proves an inauspicious debut. As a fan of classic adventure literature and pulp fiction, I understand that often a reader must suspend disbelief to enjoy a good adventure, but in this novel Burroughs asks for far too much gullibility on the part of the reader, and does not provide enough satisfaction in return. John Clayton, Lord Greystoke, is on a diplomatic expedition to Africa to investigate the working conditions at some colonial plantations. When mutiny breaks out on the ship in which he and his wife are passengers, their lives are spared, but they are abandoned on a remote beach on the west coast of the dark continent. They eventually die in this harsh environment, but not before leaving behind an infant son. This orphaned boy of noble heritage is adopted by a she-ape and raised as a member of her simian community. It’s natural that Tarzan, having grown up in this wild and savage environment, would come to possess a physical strength that would be considered superhuman by the standards of civilized men. That’s not enough for Burroughs, however, who also endows his hero with superhuman intelligence. Tarzan finds his parents’ library, and, without any contact with another human being, teaches himself to read and write. If that’s not unbelievable enough, somehow he also, with no knowledge of spoken English, manages to phonetically spell his own name. When he reaches manhood Tarzan begins to encounter some of the native African people, his first contact with humans. Eventually a party of white people appears on his secluded shores, marooned by mutineers just as his parents were decades before. Though one of them is even a relative of Tarzan, this group of English and American travelers is not out looking for the Greystokes. It is simply an incredible coincidence that they happen to end up in Tarzan’s proximity. Through Tarzan’s interactions with these white people, a series of misunderstandings arises that takes until the end of the book to resolve. For example, despite finding the bodies of Lord and Lady Greystoke and their belongings, it never occurs to any of the slow-witted castaways that this mysterious white jungle man might be their son. For brevity’s sake, I can’t begin to catalog all the convoluted story elements that continually affirm the ignorance of each and every character in this story, but the entire book is spent waiting in protracted frustration for the clueless characters to figure out things that the reader already knows. There is a fair amount of racism in the book, though not uncommon for its time. Far more offensive are the clumsily constructed plot and the frequent departures from logical reality. The best parts of the book are the action scenes, but after Tarzan kills five or six lions, even that becomes tedious. Burroughs wrote at least 25 Tarzan books. As an advocate of adventure literature, I really hope they are not all as bad as this one. Tarzan of the Apes is a rare case in which the original novel does not live up to the majority of the countless imitators it inspired. A Passion in the Desert is a short story by Honoré de Balzac. Originally published in 1830, it is one of the earliest pieces in his large body of work known as La Comédie Humaine, and one of only two works included under the category Scenes of Military Life. Unlike most of Balzac’s work, this story does not deal with the complexities of French society, but instead tells a rather simple tale of man and nature. Though Napoleon’s invasion of Egypt is mentioned briefly in the beginning, reading this story requires no prior knowledge of French history. As a result of its brevity and accessibility, A Passion in the Desert is one of Balzac’s more widely read stories. An unnamed soldier from Provence travels to Egypt on a French military campaign. There he is taken prisoner by the Maugrabins (North African Arabs), and forced to march across the desert. He escapes from his captors, fleeing across the barren wasteland until he stumbles upon an isolated oasis. A castaway on this island of life amid the sand, the soldier presumes himself doomed to a life of solitude, until he comes to form an unexpected friendship with a wild animal. The best qualities of this story are its memorable premise and its exotic setting. The plot, however, doesn’t really live up to the possibilities of either, and is not particularly exciting or compelling. The unsurprising ending leaves the reader rather disappointed and wanting more. Overall, it is a tale high on atmosphere but low on substance. Balzac is a great writer who rarely writes a bad story. A Passion in the Desert definitely qualifies as not bad, but it by no means stands out among Balzac’s awesome body of work. If you are a Balzac fan, you can’t go wrong spending a brief half hour reading any of his stories, but the overall effect left by this piece may be one of ambivalence. Casual readers unfamiliar with this master’s work will likewise find this an easy and brisk read, but it is in no way indicative of the style and subjects typical of Balzac’s writing. In the World Atlas of Archaeology, Nick Constable boldly attempts to sum up the totality of the world’s ancient civilizations in under two hundred pages. Fortunately for the reader, he succeeds surprisingly well. The book is divided into eleven regions, with a chapter each on Africa, Egypt, Mesopotamia, Greece, Rome, Western Europe, Central and Northern Europe, Russia and Central Asia, the Far East, Australia and Oceania, and the Americas. Each chapter is divided into anywhere from six to twelve articles devoted to a particular archaeological site. Constable devotes equal coverage to the lives of the inhabitants of these ancient civilizations and the latter-day explorers who discovered their remains. In its accessible tone and ease of readability, the text resembles a series of National Geographic articles, yet it presupposes a basic level of knowledge and enthusiasm on the part of the reader and doesn’t dumb down the subject matter. British spelling is used throughout the text (e.g. “colonisation”, “centred”), but beyond that there is an inexcusable number of typographical errors, including one map that’s completely mislabeled. The errors are even more unforgivable considering this is a revised edition. This volume is not an atlas in the traditional sense of the word, as the cartography takes a back seat to the text, but the maps are certainly a main attraction. They are attractive, easy to read, and uncluttered with a lot of superfluous information. The illustrations, such as reconstructive renderings of ancient buildings or cities, are very well executed, and the photographs have been judiciously selected both for context and aesthetics. Overall it is a beautifully illustrated and well designed book, with one major exception. At the bottom of each page there is a running timeline of events, which serves more as a graphic element than a useful addition to the text. The timeline restarts at the beginning of each new chapter, yet the events in the chronology bear little correlation to the subject matter of the chapter in which they appear. It’s as if a random collection of events from all over the world have been thrown together and arranged in chronological order. If the idea is to show a comparison between the state of different civilizations during a corresponding period, this could have been accomplished much more effectively by combining the eleven regions into one comparative timeline in the back of the book, executed with the same graphic quality as the excellent maps. As it stands, however, the running timeline is simply an annoyance, and after a while I learned to ignore it. New archaeological discoveries are being made all the time, and although the revised edition of this book was published in 2009, like any collection of scientific research it’s already starting to show some signs of age. The section on Ötzi the “Iceman,” for instance, goes into quite a bit of detail about the life of this Neolithic European, but it makes no mention of the fact that he was murdered, a much publicized recent discovery. Nevertheless, the World Atlas of Archaeology is an admirable encapsulation of the current body of knowledge on humanity’s past. Even if you consider yourself pretty well versed in the field, you’re likely to gain considerable insight into some corner of the globe with which you are less familiar. This book doesn’t pretend to be a scientific treatise; its purpose is to inspire wonder and curiosity in the armchair tomb raider. To that end it is immensely successful. In an earthen house in a rural Chinese village lives a poor farmer. One day he ventures into the nearest town to call at the door of the Hwang family, the richest landowners in the region. It is Wang Lung’s wedding day, and he has come to claim his bride. A slave of this wealthy household has been promised to him in a prearranged marriage. After their unceremonious introduction, Wang Lung and his new wife, O-Lan, return to the land his family has worked for generations. While struggling against the challenges of poverty, famine, natural disasters, and war, they proceed to build a family. Through hard work, prudent choices, personal sacrifice, and a little luck, the family gradually rises from their humble beginnings to a position of security and status. The Good Earth, originally published in 1931, is the first in a trilogy of novels by Pearl S. Buck, continuing with Sons and ending with A House Divided. Buck won the Nobel Prize for Literature in 1938, largely on the strength of these three works. The Good Earth takes place over the course of a few decades in the early twentieth century, including scenes of the Chinese Revolution of 1911 which overthrew the Qing Dynasty. Despite Wang Lung’s lack of knowledge or interest in political affairs, the Revolution proves to have an influential effect on the family’s fortunes. Buck provides a vivid, insider’s perspective of Chinese society at this crucial turning point on the path from antiquity to modernity. Though born in America, Buck was raised in China by her missionary parents. Her love for the Chinese people and reverence for their culture shine through prominently in this work. The Good Earth is more than just an excellent historical novel, for it deals with universal themes that are relevant to families of all cultures. Though slavery, concubines, opium, and the rise of Communism may be unique to the time and place depicted in the narrative, the family’s triumphs and tragedies carry an emotional resonance that transcends time and place. All readers can relate to the book’s depiction of the satisfaction brought by honest work, the love of parents for their children, the desire for the acquisition of wealth to improve the prospects of those children, the excessive pride that comes with such wealth, and the difference in values and expectations that arise between parents and their children as those children grow up to become adults. A recurring theme, as evidenced by the book’s title, is Wang Lung’s love for the land. The further he and O-Lan drift from their simple agrarian roots the less happy their lives become. The children, on the other hand, are all too eager to renounce the farming life, but though they may succeed in urban pursuits, somehow their lives seem devoid of meaning with no connection to the land. For some, this vision of rural life may seem overly romanticized, but for readers who are receptive to such a message the book leaves a powerful and meaningful impression. Anyone who has enjoyed such agricultural epics as John Steinbeck’s The Grapes of Wrath or Knut Hamsun’s Growth of the Soil will feel a similar kinship to The Good Earth. Throughout the book, Buck’s prose is absolutely superb. Not a word is wasted. Every letter she pens goes to forward the story, without any pretentious or self-indulgent wordcraft. At times the text bears the simplicity of a fairy tale, yet the imagery is grounded in gritty realism. With a few sparse phrases, Buck manages to paint pictures of incredible power and depth. Nowadays Buck’s name is rarely mentioned among America’s greatest writers, yet her Nobel Prize was no fluke, and she definitely deserves high regard for this masterpiece. Were it not set in China, The Good Earth might just be the Great American Novel. This is one of Jack London’s lesser known short story collections. Despite the exotic title, none of the stories take place in Tasmania or the South Seas. Five of the stories take place in northern California, two in the Klondike, and one in an undisclosed location during the paleolithic era. London is primarily famous as an author of wilderness adventure tales and of stories imbued with socialist political ideas. While there are a couple examples of the former, the latter genre is curiously absent from this volume. No politics at all. As an overall body of work, this collection is weak by London’s standards, but a few gems shine out from among the rest. In the opening story, “By the Turtles of Tasman,” Frederic Travers, a responsible man of high standing, gets a visit from his dying brother Tom, a globetrotting vagabond. It’s a study in contrast between the two men, who each embody opposing aspects of London’s character: the successful workaholic vs. the wandering adventurer. The writing is very mature and insightful, indicative of some of the more accomplished work of London’s later career. Another noteworthy story is “Told in the Drooling Ward,” a first-person narrative as told by a feeble-minded inmate of a mental institution. London does an admirable job with the narrator’s voice and treats the character with sensitivity and respect. A story I had never heard of that really blew me away was “Finis.” A starving man, stranded along the Yukon River in winter, waits to prey upon an unsuspecting traveler in order to save himself. It is as bleak and visceral as London’s famous story “To Build a Fire.” Suspenseful and skillfully told, it’s an excellent story that deserves to be better known. The other five stories in the collection are “The Eternity of Forms,” “The Prodigal Father,” “The Hobo and the Fairy,” “The First Poet,” and “The End of the Story.” These range in quality from the disappointing to the forgettable. Like many of London’s collections, you have to sift through a few pans of dirt to find the gold nuggets. Few titles signify the thrill of romantic adventure as much as The Three Musketeers. Originally published in 1844, this historical novel by Alexandre Dumas established an archetype for all subsequent adventure literature. From that point on, any swashbuckling hero to grace the printed page or silver screen must be judged against the benchmark set by these three titular gentlemen and their protégé. Very few heroes, indeed, have been able to measure up to their dashing, their daring, and their devil-may-care attitude. While the Musketeers may be a household name in popular culture, today’s audience, desensitized by countless action movies and paperback thrillers, may wonder if the original novel is still worthy of reading. The answer, without hesitation, is a resounding yes. Young d’Artagnan leaves his home village in Gascony to seek his fortune in Paris. His dream is to become one of the King’s Musketeers. Though possessed of the swordsman’s skill and cavalier disregard for his own life required for the position, d’Artagnan is nonetheless a wet-behind-the-ears provincial who needs guidance in the workings of big-city society. Though his initial encounters with the renowned Musketeers Athos, Porthos, and Aramis are clumsy and contentious, the four companions soon form an inseparable bond of friendship sealed by the vow, “All for one and one for all!” When the Prime Minister of France, Cardinal Richelieu, employing as his henchmen the cold-blooded swordsman the Comte de Rochefort and the beautiful but diabolical Milady de Winter, schemes against the Queen’s honor, our heroes must valiantly come to her rescue. In this novel, Dumas ably demonstrates his mastery at creating complex and intriguing characters. Not only does each of the four main heroes possess a unique and memorable personality, each and every character from the King himself down to the lowliest, briefly mentioned innkeeper is a singular, fully fleshed out creation. Milady de Winter is hands down one of the greatest femme fatales in literature. To his credit, Dumas unflinchingly makes her as dastardly and nefarious, if not more so, than any masculine villain would be in her place. If there is a flaw to The Three Musketeers, at times it is the plotting. Dumas demonstrates his usual deftness at juggling a large ensemble cast in a variety of interlocking adventures, but there are several dragging moments amidst all the capers, talky interludes in which the swordsmen gamble, mooch their way into free meals, or swindle their mistresses out of some coin. These scenes help to enhance character development, but nonetheless slow the momentum. Toward the end of the book there is a series of 10 or 12 chapters when Dumas abandons the Musketeers entirely, in order to concentrate on the scheming of the villainess. This proves too long an absence from such beloved heroes. As good as this book is, its sequel, Twenty Years After, is actually even better and more skillfully plotted. And though he may be more famous for his Musketeers, Dumas’s greatest work is undoubtedly The Count of Monte Cristo, an absolute masterpiece. The most surprising thing about The Three Musketeers is its remarkable change in tone from beginning to end. It starts out a slapstick comedy and ends about as dark and shocking as a swashbuckler can get. It is a testament to Dumas’s skill as a storyteller that such a drastic transition feels not only natural but necessary. Along the way the reader is treated to one heck of a roller coaster ride that, despite being crafted over a century and a half ago, is still incredibly fresh, exciting, and fun. In the tiny provincial village of Saint-Aubin-les-Marais, a young man is found dead on the railroad tracks, having been run over by a train. Despite the seemingly obvious cause of death, rumors start to float around the small town that the young man was murdered by Etienne Naud, whose daughter Geneviève was rumored to have been having an affair with the now deceased young man. Troubled by these rumors, Naud seeks help from his brother-in-law, Victor Bréjon, a magistrate in Paris. Bréjon turns to his colleague Jules Maigret, Superintendent of the Police Judicaire, and asks him, as a personal favor, to go to Saint-Aubin, uncover the facts of the case, and dispel these rumors before they do further harm to his brother-in-law’s reputation. Once Maigret arrives in the small town and takes up lodging in the house of Naud, he feels like anything but a welcome guest. The town appears to be divided into two factions. The higher class citizens, consisting of the Naud family and their friends, simply want to forget about the unfortunate death and write it off as a mere train accident. But a small group of laborers, the victim’s peers and coworkers, insist the death was murder and demand that justice be done. I have read a few of the earliest Maigret novels, and have always found the character of Maigret to be somewhat of a blank slate. This novel, originally published in 1944 under the French title of L’Inspecteur Cadavre, is the 47th installment in the series. Unlike the earlier books of the 1930s, this novel provides a great deal more insight into Maigret’s personality. Though written in the third person, most of the novel follows Maigret’s train of consciousness, allowing the reader access to the detective’s innermost thoughts, with the exception, of course, that none of the vital secrets of the mystery are revealed until the end. The “rival” mentioned in the title is Justin Cavre, nicknamed Inspector Cadavre, a disgruntled former employee of Maigret’s. Now a private investigator, Cavre shows up in Saint-Aubin on the very same train as Maigret, and his actions seem to indicate that he is bent on thwarting Maigret’s investigation. Unfortunately, we don’t get to see much head-to-head intellectual dueling between the two. For most of the book, Cavre is offstage somewhere. We only really learn about him through Maigret’s thoughts. Mostly we see Maigret interacting with the citizens of Saint-Aubin, slyly coaxing out their closely guarded secrets. It is a joy to watch Maigret function in this small-town setting, where he is clearly a fish out of water, or perhaps rather a bull in a china shop. The final chapter of the book is somewhat disappointing. Few surprises are revealed, and the guilty parties don’t receive the comeuppance they deserve. Yet the journey that leads up to this unsatisfying conclusion is an enjoyable ride, replete with the noir atmosphere and psychological authenticity characteristic of Simenon’s writing. Maigret’s Rival is not the detective’s most remarkable case, but it’s still a worthy read.